Find hotel near Khinlom Chomsaphan Restau .. If you are big on nice views while indulging in a meal, a trip to the Khinlom Chomsaphan Restaurant has got to be on your list of things to do in Bangkok. Tucked into a part of the street this restaurant is popular for its seafood delicacies. The blue crab salad, seafood grill platter, curry powder mud crab and signature cocktails are some of the most popular items on the menu. Offering you a gourmet Thai food experience along with a panoramic view of the Chao Phraya River and the glorious Rama Bridge, this restaurant is a wholesome experience. All this goodness may make you think of this place as an expensive affair, but you are in for a glad surprise! 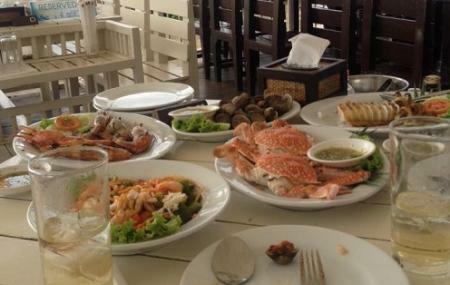 Thai seafood delicacies are the specialty of this restaurant. How popular is Khinlom Chomsaphan Restaurant? People normally club together Wat Chana and Khao San Road Night Market while planning their visit to Khinlom Chomsaphan Restaurant. This restaurant is right next to the river. The location offers a nice view of Rama VIII Bridge. You need to make sure you reserve a table in advance. We were lucky to show up to get a table somewhat close to the river before the dinner rush. Sadly, we were right next to a small area that the restaurant has set aside as a smoking area. (Given the fact that new smoking laws have recently come into effect at the time I wrote this review, the restaurant needs to seriously rethink allowing smokers to smoke right next to tables where people are eating.) Regardless of a smoking area stuck right next to the side of the restaurant, I do recommend this place. I strongly suggest you arrive before 6 p.m. to order your food as I noticed many tables were waiting a while for their dishes. However, from what I saw, many of the guests stayed for a longer time as they were also ordering drinks. They had a wide range of drinks at a reasonable price. The food was a tad more expensive than other popular Thai restaurants, but most of us enjoyed everything that we ordered. However, we felt cheated with the pineapple fried rice. The picture on the menu made it look like half of a huge pineapple would be hollowed out to contain rice whereas we got a very small pineapple. The same price I have paid in the past at other restaurants for pineapple fried rice always got normal-sized large pineapples, not the baby pineapple they served us. I kid you not, if I had wanted to, I could have held the amount of rice we got in my hand as it was barely one cup of rice. They did have a live band that may have been too loud if we sat near where they were playing. The quality of music was satisfactory. TIPS -If you want a riverside dining experience, this is a nice restaurant to go to but you will need a car as it is not easy to get to or find without Google Maps. -Make a reservation. -You should also arrive slightly before the 6 p.m. dinner rush and insist that you not sit right next to their smoking area (on the right of the restaurant if you're facing the river). Boring food at the riverside. Of course the bill wasn’t cheap. Their “smoothies” are simply nasty, a mix of fruit pulp and a ton of sugar syrup, not real smoothies. I left the place angry, not going back. Great food , awesome service . Was busy when we went there but the food still didnt take long . Nice bridge view, good thai food with live music.